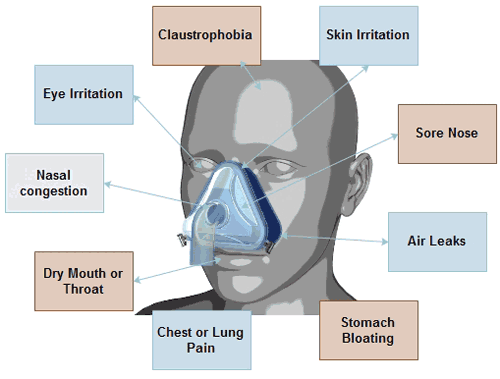 In this page you will learn about the most common CPAP mask problems that can be found in CPAP therapy for sleep apnea. You will also learn how to overcome these mask problems. You probably know that CPAP can save your life, and you are happy that your doctor recommended the machine. 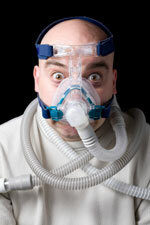 Unfortunately, few patients can sleep with CPAP without having some problems, especially from the mask. If you don't have the right type of mask for your unique face, then you'll be in trouble. Now let's take a better look on the most common CPAP mask problems, to learn how to fix them. The following list contains typical issues found in CPAP users. However, if you don't find information about your mask problem here, then take a look on our database of CPAP problems. Surely there are more chances to find something that can help you with your CPAP therapy. how to choose your first mask? Wear the mask for the last waking hour, disconnected from the machine. Watch TV, listen to some music, have a bath etc. Stuff you enjoy. If the brain links wearing the mask with enjoyment, chances are it'll be better during the night too. Using tape or women's hair clip tools (whatever they're called) fix the mask or headgear to your head. Now when you rip it off, it'll wake you up so you can correct yourself. Reactive instead of preventative. Aromatherapy scents can also help associate good feelings with wearing the mask. Trick the brain into good associations. If you are using a nasal mask, you could use a CPAP chin strap over the headgear, which will also help with keeping it on. You can put your hair in a pony tail and pull it under the top strap of your mask. When you secure the bottom strap of the mask, the hair is held in place along the back of your head. You can put the straps over your hair while you're laying down, flip the hair up to get it off your neck and then adjust the pillow so it also helps with the bottom strap. Occassionally, you'll have to adjust the strap or mask. Try of going with a shorter cut. Pay attention to what cleaning products you use for CPAP mask. All of the mask manufacturers say to use MILD soap products when GENTLY washing our mask cushions and frames. Many specifically say NOT to use harsh or anti bacterial products. If you have sensitive or allergic skin to a lot of soaps, you can use Ivory Dish Soap liquid. If you have soap residue left in the mask or the humidifier chamber, you can do the vinegar water rinse. The vinegar rinse is the only thing that helps cut the murky residue left over time. The drooling means yuo have your mouth open. Perhaps the mask isn't ideal for you. You can keep the mouth stable with a CPAP chin strap, or pick a full face mask with a chin cup, such as the FlexiFit 432. Those cupping bits of plastic help prevent the mouth from opening too far. What CPAP Mask to Use For Stomach or Side Sleepers? ResMed Mirage Swift is very comfortable for stomach and side sleeping. These nasal pillows are leak-free at high pressure and work well with Bi-level PAP. You can also wear glasses with this interface - handy if you read yourself to sleep, or during recovery from surgery if you want to watch TV without worrying about nodding off from medications. Another mask that many people like is ResMed's Activa. This one works particularly well at high pressures, but people like it at lower pressures. ResMed's Activa has an "active cell", which is like a single bellows on an accordion. The active cell does two important things. You fit it loose on your face and the pressure from the cpap will "push' the cushion against your face. If you use an AUTOPAP and the pressure is increased the cushion pressure is increased to avoid leaks. The other benefit for you is that the active cell allows the cushion against your face to stay in place when the hard part of the mask moves. You can put it on, turn on the CPAP and wiggle the main part of the mask around - and the cushion stays in place. It can be a blessing with all of the tossing and turning you probably do. A special pillow can help you with your Resmed Mirage Swift. If you sleep on your stomach and prefer little to no elevation, consider the Core CPAP Pillow. If you like more elevation, the Tri Core CPAP Pillow or CPAP Max Pillow is what most cpap users prefer. Both pillows can be place on your reguar pillows if additional elevation is needed. One tip - if nasal pillows leak, you probably have the size too small, so go up one size. If your nostrils are getting irritated, you probably have the pillows "forced" into the nostils - remember, they should just barely slip in to the nostrils, NOT be shoved in too far. The Breeze CPAP Mask has an angle adapter to allow for a custom fit. If your nose is being pushed up in any way, you are wearing the interface wrong. Occasionally, your nostrils do get slightly irritated and so you can use a tube of Neosporin handy...just a little dab will lubricate and heal at the same time.